of the oldest buildings in the Territory, it was originally built in 1893 and holds a liquor licence that has been in continuous use since 1938. The stories these walls could tell . . .
Airborne locals at the caravan park! 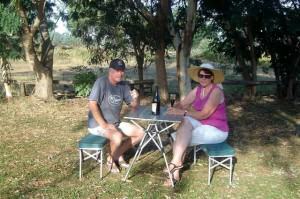 We pulled into the Daly Waters Pub Caravan Park ([star][star][star]) and set about getting the camp organised. The park only has twenty sites and they were filling fast; we were glad that we’d arrived early. The amenities were interesting and very . . . outback . . . but they were clean, and the park was filled with lots of green grass and shade trees. While we were setting up camp an aeroplane started buzzing the caravan park. He was quite low and I hoped he was paying attention to what he was doing. Don’t worry, one of the locals assured us, he’s just trying to get our attention. What? He hasn’t heard of a radio? No, he just wants someone to pick him up from the airport when he lands! Airport? 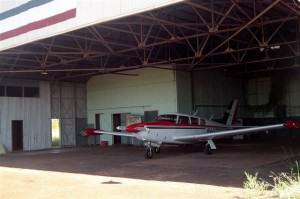 Daly Waters has an airport? Indeed it has. The Outback Servo: note the helicopter on the roof! today to service folks from the outlying areas. 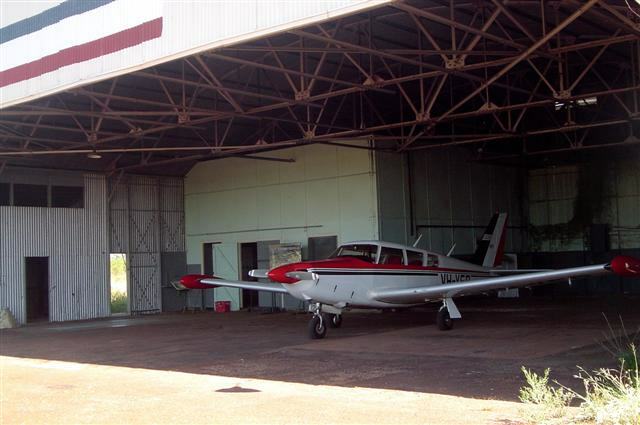 Built in 1930, the building is the oldest aviation structure in the Northern Territory. 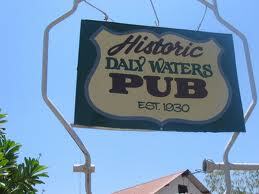 We left the airport and set out to explore Daly Waters. We drove out to the main highway only a kilometre away and that was it, the end of Daly Waters. The pub, the caravan park, and the airport . . . that’s it. Well, they did tell us that there wasn’t much here. 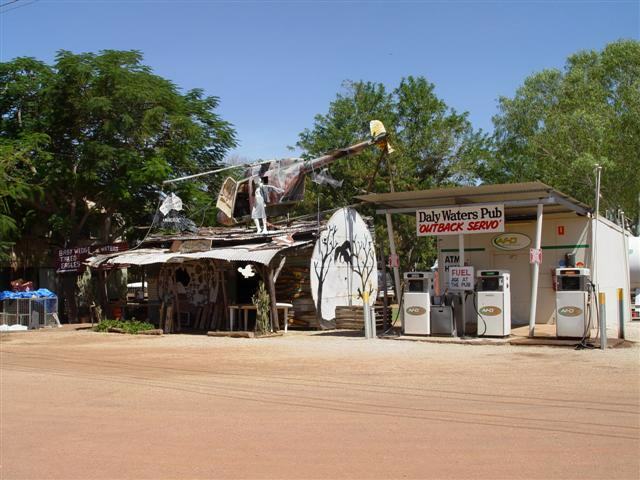 Daly Waters, population 23 (most days), is built on an old stock route and in the early days was nothing more than a drover’s rest for the long cattle drives from the Kimberleys in Western Australia to Queensland. It isn’t much more than that today, being merely a stopover for travellers on the Stuart Highway but the pub is fascinating. Amongst the memorabilia in the pub is a wall of bank notes from just about every country on Earth. It seems to be somewhat of a tradition for foreign visitors to add a note from their country. Late in the afternoon we sat in the shade of some big old trees and enjoyed a bottle of Two Tails Sparkling Wine before tackling the nightlife, such as it is, in this perfect outback town. Man. I guess Elton John wasn’t available that day. We stayed in the pub until the show was over; not having far to travel the next morning, we weren’t worried about an early night. But you know what they say about the best laid plans . . .
Caravan parks are a world of their own but there are some people in that world who have absolutely no concept of consideration for others. Our neighbours had a conversation, a loud conversation, starting at around 4:30 this morning! And they didn’t stop until around 7:00 when they must have gone back to bed because they became very quiet and their van was all shut up. (I wish they had!) And so we got an early start whether we wanted it or not! Daly Waters is a must-do stopover; you’ll kick yourself if you miss it. It’s the kind of place where you can walk from one end of town to the other in about 5 minutes and see all there is to see, but it has character by the bucketload, and some very interesting characters in residence, as well, but we wouldn’t have missed it for the world.